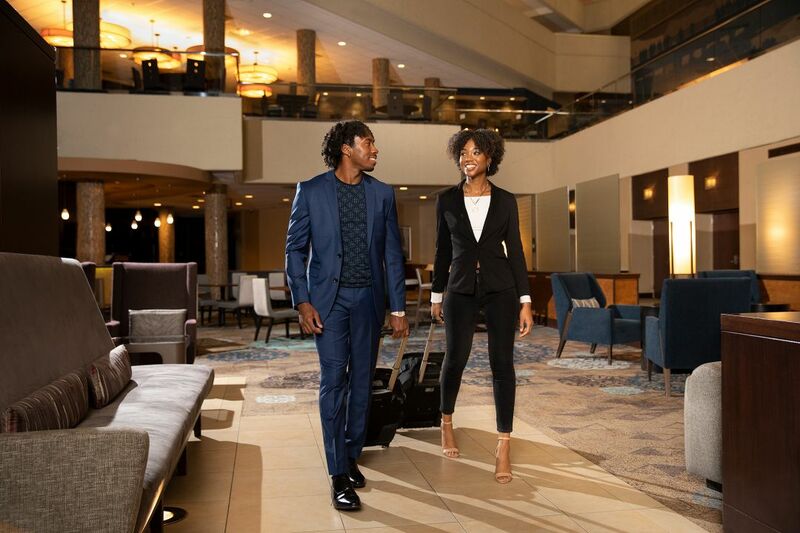 Stay in one of 633 stylish rooms, including 18 suites, in downtown Columbus with contemporary conveniences including sleek granite-top workstations and Portico bath amenities. Choose a deluxe room for impressive views of the Columbus skyline, the Arena District, or the Short North Arts District, or stay in a suite with a conference table, perfect for small meetings. Indulge in this sophisticated suite that features 1,352-square-feet and contemporary decor across separate living and dining areas. Entertain guests in the spacious parlor with plush sofas and views of downtown Columbus. Bask in our spacious suite offering 1,014 sq ft of space with a bedroom featuring one king or two double beds. Gather around a six-person conference table or lounge in the sitting area with a plush sofa bed and separate work area. Revel in this 481-square-foot room with a plush king and a spacious L-shaped layout. Take in views of the Columbus skyline, Arena District, or Short North Arts District from this sleekly designed room with inviting lounge seating. Admire views of downtown Columbus and the Arena District from this stylish room of 338-square-feet, with a king bed and large granite-topped work desk. Feel at home on cozy lounge furniture and deluxe bath amenities. Take in views of downtown Columbus, the Arena District, or the Short North Arts District from this 338-square-foot room with two plush beds. Stay productive on the over-sized workstation and relax on cozy lounge furniture. Stay comfortable in this sleek room boasting 338-square-feet and a plush king bed. Work on the large granite-top desk or play on the cozy lounge seating, with windows overlooking the Columbus cityscape. Stretch out in this 338-square-foot room with two double beds and a generously sized work area with a granite-top desk. Enjoy views of downtown Columbus or the Short North Arts District from this cozy room with lounge seating. Get comfortable in this stylish accessible room featuring 338-square-feet and a king bed. Stay fresh in the deluxe bath with ADA amenities and upscale toiletries or get to work on the large granite-top desk. Delight in this 338-square-foot room with accessibility features and two double beds. Enjoy a deluxe bath with ADA amenities, a spacious work area with a granite-top desk, and sleek lounge furniture. Take comfort in this accessible room featuring 338-square-feet and a plush king bed. Freshen up in the deluxe bath with a roll-in shower or stay productive on the over-sized workstation. Enjoy this contemporary room of 338-square-feet with two double beds and an accessible bath with roll-in shower and deluxe amenities. Lounge on the over-sized chair or take care of business on the granite-top work desk.